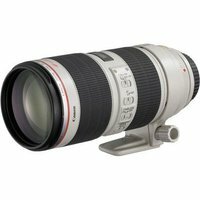 The Canon EF 70-200mm f/2.8 L IS II USM lens features a redesigned optical system that delivers incredible results. A high-performance fluorite element is combined with 5 ultra-low dispersion (UD) elements to reduce chromatic aberration and producing high-contrast, sharp images. An inbuilt Image Stabiliser mechanism reduces the effect of camera shake in lower light environments. Canon EF 70-200mm f2.8 L IS II USM Lens - in MINT condition - Looks Unused.